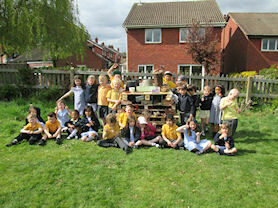 Year 1's topic this term is 'Caring for Others and Our World'. We have been thinking about how we can care for animals, including mini-beasts and about how we could give them shelter. 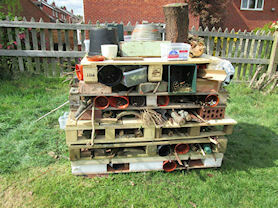 A 'Bug Hotel' was one of the ideas we came up with. All week, we have been collecting various items from home to build our hotel and worked as a team on Wednesday afternoon to assemble our masterpiece! We chose to put the biggest, heaviest pallet on the ground first so it would be nice and sturdy. 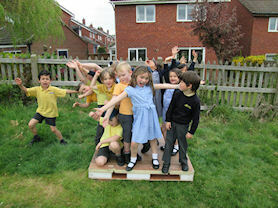 We checked to see if was strong enough to hold our weight! 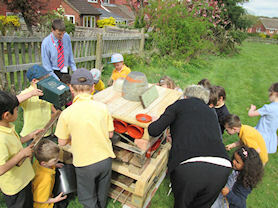 Each group took it in turns to layer up the pallets and bricks. 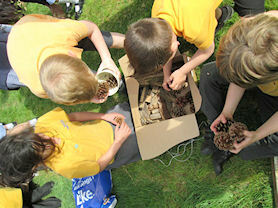 We used everything we brought in from home, including wood, stones, pinecones, twigs and plant pots. 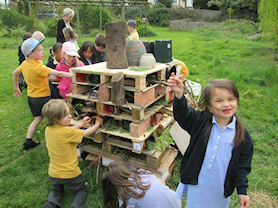 We carefully thought about where to put the items so that the bugs would have lots of small gaps to shelter between. We cannot wait to see which mini-beasts come to visit! Testing the strength of the pallet. Layering the pallets and bricks. Using everything we brought in from home.